We all share good news with others, whether it is about a new job, a great vacation, or what Jesus Christ has done for us. Be intentional in creating and capturing opportunities for sharing the “Good News” by establishing routines that can make spiritual conversations a natural part of your family dynamic and your everyday experiences with others you encounter throughout your day. One Verse Evangelism is a simple way to share the story of Christ's love. 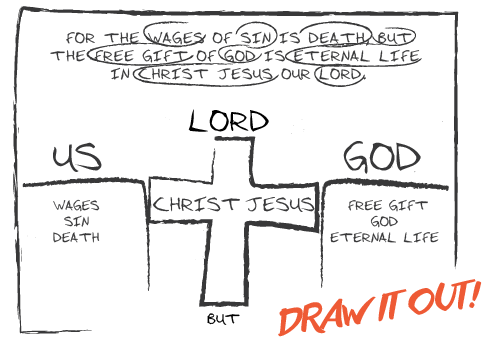 It's easy to learn because it uses one verse, Romans 6:23. 3. How I invited Christ to forgive me and take control of my life. . . Ask a friend, spouse, or family member if you can practice sharing your story. This will allow you to feel more comfortable in the future when there is an opportunity and is also a great time to ask for any feedback they might have. Begin praying that God would give you opportunities to share the Good News with others. Be aware and take advantage when these opportunities arise. Use an Eternal CPR card and list the names of four individuals in your family, workplace, or school, etc. that you would like to build a relationship with so you can share your story. Place the card where it will be a good reminder for you.